If you love popcorn, you'll be pleased to know that it offers many surprising nutritional benefits. Not only is popcorn low in calories, but it is extremely rich in antioxidants and delivers a healthy dose of fiber to aid in digestion and heart health. If eaten plain, popcorn can fill you up with only trace amounts of saturated fat. On the other hand, if you add toppings like butter, caramel, or the hydrogenated soybean oils used in movies houses, you may find yourself tripling the calorie count and consuming as many as 6 grams of saturated fat per serving. Popcorn can be a perfect snack for dieters. Even if you're not trying to lose weight, popcorn is whole grain food that offers many of the same benefits of corn, rice, wheat, barley, and oats. If you're on a 2000-calorie diet, you should aim for between 225 and 325 grams of carbs per day. If you need to lose weight, you can get faster results by eating 50 to 150 grams per day. A single three-cup serving of popcorn provides nearly 19 grams of carbohydrate and 14.5 grams of net carbs. This makes popcorn an acceptable snack for most low-carb diets if consumed in moderation. However, popcorn cannot be eaten on phase one of the South Beach Diet and is strictly limited during the induction phase of the Atkins Diet. The dietary fiber in popcorn comes from the indigestible carbohydrates that pass through the digestive tract. A three-cup serving provides between 10 percent and 15 percent of your daily fiber need. As a frame of reference, women need around 25 grams of fiber per day and men need 38 grams per day. If air-popped, popcorn delivers only trace amounts of fat. Most are "healthy" monounsaturated and polyunsaturated fats, as opposed to the "unhealthy" saturated fats that clog arteries. Many people wrongly assume that plain microwave popcorn is pretty much the same as air-popped popcorn. The problem is that most microwave popcorn brands use hydrogenated or partially-hydrogenated oils that contain harmful trans fats. These are the fats that contribute to heart attacks, stroke, and other serious diseases. Popcorn popped in oil provides 192 calories and 14 grams of fat per three-cup serving. Butter topping adds another 102 calories, 12 grams of fat, 7 grams of saturated fat, and 91 milligrams of sodium. Grated parmesan adds another 22 calories, 2 grams of protein, 1 gram of fat, and 76 milligrams of sodium per tablespoon. The average movie house popcorn, topped with buttery powder known as Flavocol, delivers no less than 20 grams of fat, 300 milligrams of sodium, and 40 grams of carbohydrate. A three-cup serving of popcorn delivers 3.1 grams of protein, a relatively modest amount equal to one cup of cooked broccoli. By way of reference, an average sedentary man needs around 56 grams of protein per day, while a sedentary woman would need roughly 46 grams per day. Most of us think of popcorn more as a snack food than health food. But popcorn actually delivers significant health benefits, aiding in weight loss, improving digestion, and reducing the risk of heart disease, diabetes, and maybe even cancer. Air-popped popcorn is the ideal diet snack simply because it fills you up faster and takes longer to eat than, say, one 100-calorie Fig Newton bar. A 2010 study published in the Nutrition Journal reported that, among 35 normal weight adults, popcorn was far more satiating than even potato chips. In comparing the two, the study participants reported that 15 calories of popcorn were just as filling as 150 calories of potato chips. Most of the fiber in popcorn is insoluble, the type that helps keep you regular. Rather than drawing water from the intestines, it builds bulk in stool and speeds the transit time through the intestines. It works much in the same way as psyllium, providing gentle relief of constipation while reducing the risk of hemorrhoids and gut infections. The fiber in three cups of popcorn is equal to that of one cup of cooked brown rice or oatmeal. While this shouldn't suggest that popcorn is a reasonable substitute for nutrient-packed whole grains, it does illustrate popcorn's value in maintaining good digestive health. Popcorn is one of the better sources of a type of antioxidant called polyphenol, according to a 2012 study presented at the American Chemical Society conference in San Diego. Ounce-per-ounce, popcorn packs twice the amount of polyphenol per serving than fruit and nearly three times the amount of most vegetables. Polyphenols are linked to numerous health benefits. By eliminating free radicals, polyphenol can significantly reduce vascular inflammation, improving blood circulation and lowering blood pressure. This, in turn, reduces the risk of atherosclerosis (hardening of the arteries) and cardiovascular disease. Natural polyphenols, which include flavonoids, phenolic acids, lignans, and stilbenes, are also linked to a reduction in the risk of certain cancers. A 2012 review of studies suggested a link between a high intake of polyphenols and the reduced incidence of breast and prostate cancer specifically. Is popcorn healthy for everyone? Generally speaking, most people can eat air-popped popcorn without any problems or side effects. Due to the increased intake of fiber, some people may experience bloating, gas, and loose stools. However, most of the harm will likely come from the fats popcorn is cooked in or the chemicals used to flavor the kernels rather than the popcorn itself. 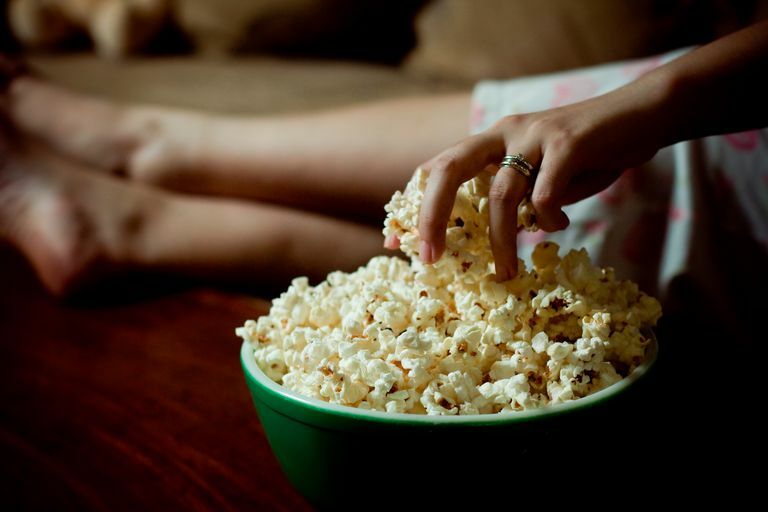 Can microwave popcorn cause cancer? Some experts have expressed concerns about a substance known as perfluorooctanoic acid (PFOA) which lines the bags of most microwave popcorn bags. PFOA is the same substance used for coating many non-stick pans. While the U.S. Food and Drug Administration (FDA) has concluded that the amount used in microwave bags is safe, animal studies have shown that PFOA poses a potential, albeit small, risk of liver cancer. Given that PFOA levels tend to accumulate in tissues over time, further research may be needed to evaluate the long-term risks of PFOA in frequent microwave popcorn eaters. A 2005 study from the FDA estimated that microwave popcorn could account for as much as 20 percent of the PFOA levels measured in an individual consuming 10 bags per year. Are there "healthy" microwave popcorns? Skinnygirl Butter and Sea Salt Popcorn (6-cup pack): 160 calories, 6 grams of fat, 2.5 grams of saturated fat, 400 milligrams of sodium, 28 grams of carbohydrate, 4 grams of fiber, and 3 grams of protein. Act II Extreme Butter Popcorn: 160 calories, 9 grams of fat, 4.5 grams of saturated fat, 280 milligrams of sodium, 19 grams of carbohydrate, 3 grams of fiber, and 3 grams of protein. Act II 94% Fat-Free Butter Popcorn: 130 calories, 2 grams of fat, 0.5 grams of saturated fat, 190 milligrams of sodium, 27 grams of carbohydrate, 4 grams of fiber and 4 grams of protein. If watching your calorie intake, buy smaller 100-calorie microwavable popcorn packs offered by some manufacturers. This can help you maintain better portion control. Diverticulitis is an infection or inflammation of the digestive tract that causes the abnormal formation of pouches in the intestines. In the past, doctors would warn their patients off seeds, nuts, and popcorn, fearing that the kernels could get lodged in the pockets and trigger an inflammatory attack. Today, there is little evidence that any of these foods cause diverticulitis. In fact, by increasing insoluble fibers through popcorn and other whole grains, you will be more likely to maintain normal bowel movements and reduce any stress on the intestines. It is also believed that the polyphenols in popcorn may help reduce the inflammation that can trigger a diverticular attack. If you want to make your popcorn as healthy as possible, air pop it at home. You can then sprinkle it with seasonings or a small dash of salt. You can also microwave your own popcorn at home without a bag. Simply put a few tablespoons of kernels in a microwave-safe bowl, cover it, and place in the microwave for two to four minutes until the popping has slowed to one pop per second. Popcorn allergies are as uncommon as corn allergies, but they do occur. While they tend to affect people with a known allergy to rice, wheat, rye or soy, scientists have been unable to establish the exact mechanism of cross-reactivity. People allergic to popcorn may also be cross-reactive to certain tree pollens and grasses. Symptoms, if any, tend to appear within two hours of eating a corn product and may include rash, hives, nausea, diarrhea, the swelling of the lips, and a tingling sensation in the mouth. On rare occasion, the reaction may be severe, leading to a potentially life-threatening, all-body known as anaphylaxis. Call 911 or seek emergency care if you develop shortness of breath, wheezing, rapid heart rate, lightheadedness, or the swelling of the face, tongue, or throat after eating popcorn. If left untreated, anaphylaxis can lead to shock, asphyxiation, heart or lung failure, and death. There are no known drug interactions to popcorn. American Chemical Society (ACS). Popcorn: The snack with even higher antioxidants levels than fruits and vegetables. ACS Meeting; San Diego, California; March 25, 2012. Begley, T.; White, K.; Honigfort, P. et al. Perfluorochemicals: Potential sources of and migration from food packaging, Food Additive Contaminants. 2005:22(10):1023-31, DOI: 10.1080/02652030500183474. Nguyen, V.; Cooper, L.; and Lowndes, J. Popcorn is more satiating than potato chips in normal-weight adults. Nutr J. 2012 Sep 14;11:71. DOI: 10.1186/1475-2891-11-71. Zhou, Y.; Zheng, J.; and Li, Y. Natural Polyphenols for Prevention and Treatment of Cancer. Nutrients. 2016 Aug;8(8):515. DOI: 10.3390/nu8080515.